The Endless Stairs quilt block pattern is super easy, so easy that you can crank the blocks out in no time at all. The 8" finished size makes the quilt blocks usable in many projects, from toddler quilts on up. Replace suggested fabrics with colors and styles that suit your needs. Finished block size: 8" x 8"
Materials Required for One Block Blue fabric: (1) 3" x 19" strip. This can be a medium to a dark. The fabric should definitely read as blue and can be a print, a tone on tone or a mottled fabric. Do not use large multicolor prints that appear to be a mix of several colors from a distance. Blue should be dominant. The blue we chose is somewhat directional, but that works okay for this block. It's best to avoid stripes. Neutral: (1) 2" x 19" strip. This can also be a print, a tone on tone or a mottled fabric, but the same guidelines apply -- creamy neutrals, white, even gray -- but the neutral should rule. The print we used is a creamy neutral color, not yellow. More examples follow with layout ideas. Cutting strips from the longest edge of a fat quarter produces strips slightly longer than necessary but offers plenty of opportunities for squaring-up. Sew your strips together lengthwise. Press seam allowance towards the blue fabric. Square up one end of the strip set and then cut (4) 4-1/2" segments from it. Don't stop here. You'll find important directions next along with some quilt layout examples. Arrange the four block segments into two rows. Sew the components of the top and bottom rows together. Press seam allowance toward the unpieced panels (blue for the top row, cream for the bottom). Join the rows, ​abutting the center seams for a perfect match and making sure all other edges are aligned. Press. The quilt block should measure 8-1/2" x 8-1/2". Continue for Endless Stairs quilt layout ideas. A scrappy Endless Stairs quilt might have a mix of values in the blue and neutral areas. 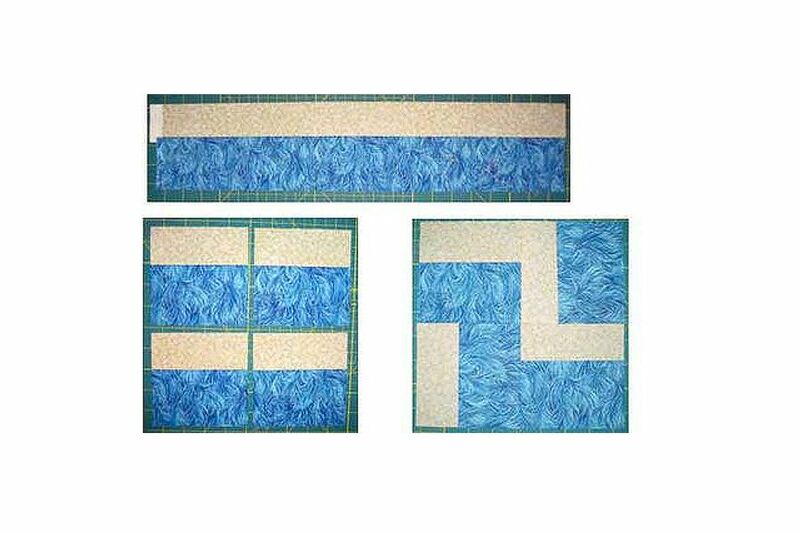 Try arranging Endless Stairs quilt blocks in geometric "Y" patterns. The Endless Stairs quilt block pattern is a great option for volunteer "blanketeering," like for Project Linus, which provides love, a sense of security, warmth, and comfort to children who are seriously ill, traumatized, or otherwise in need through the gifts of new, handmade blankets and afghans.